Hannah Genders tours some unusual gardens while on a cycling holiday in Spain. 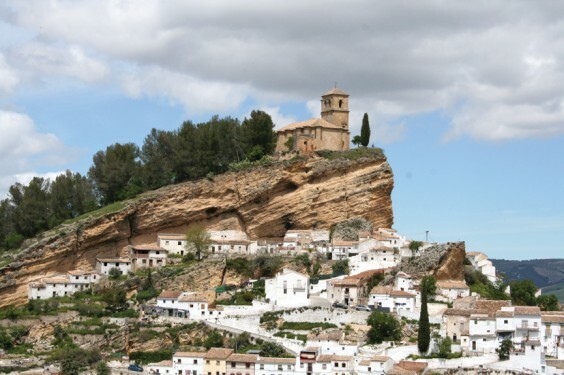 Last April, my husband Mike and I had a cycling holiday in Andalusia, Southern Spain. We cycled “The Route of the Moors”, which followed the Moorish heritage route from Cordoba to Granada – it really is a beautiful area of white villages and olive groves, but the absolute highlight for me, and something I’ve wanted to do for a long time, was a visit to the Alhambra Palace and gardens. Alhambra means “The Red One” in Arabic, and the name is believed to refer to the colour the stone looks in the evening sun as it glows a deep pinky red. The palace and gardens stand on a massive outcrop of rock in the old part of the city of Granada, and the setting alone is incredible in itself; a great swathe of trees under the palace and along the hillside sweep into the streets of the old city. The palace and gardens are accessed by a long uphill walk from this part of the city, and they are quite shaded which was a welcome relief on a hot day. We had pre-booked tickets and it’s very advisable to do this as they had completely sold out when we got there. The main palace and inner courtyard gardens date back to the 13th century and the architecture is heavily Islamic. The outer gardens and buildings are called “Generalife”, meaning Architect’s Garden, and these are extensive and very beautiful. Images of the courtyards and water gardens from these areas are instantly recognisable. The top terraces of the Generalife gardens are laid out to vegetables and fruit trees, punctuated with large, square stone towers and stunning views out to the Granada plain or back to the Sierra Nevada mountains behind. Then as you continue, classic rills of water draw the eye further into the gardens and pick up the main theme of this garden, which is water: the sound of water, running water and still, calming water in the courtyard spaces. In a dry, hot climate like this one, to create paradise in an Islamic garden was to create an enclosed, shaded space with water to cool you on a hot day. From the central rill, you walk into one of the most iconic courtyard spaces, the court of La Acequia, where an impressive colonnade surrounds a central rectangular pool, with numerous fountains pouring in at each end. The name actually means “the ditch” in Spanish, but that doesn’t really do justice to this wonderful garden, so beautifully proportioned and planted with box hedging and generous flower borders. It was wonderful to be there and take it all in. From one end of La Acequia, you can take the water staircase up to the highest point of the gardens. Water pours down the handrails on the staircase and you climb under the shade of laurel trees, which have formed a tunnel overhead. The highest point affords more views out over the gardens and the main palaces; the layout is again formal with clipped box, magnolia and orange trees, and the water theme is here again, in the form of small jet fountains. This is a more modern area of the garden and mainly dates back to the 19th century, but the design is really seamless throughout. It is up here that you come across the famous Alhambra outdoor theatre, which was added in the 1950s and now hosts world class operas, ballets and music festivals. Lower down, in the older part of the Alhambra, are the Nasrid palaces, a reference to name of the Muslim dynasty who ruled Spain in the 13th century. Although these areas have courtyards, they have less in the way of planted gardens. The architecture is very Islamic and very beautiful, and to visit these palaces you need to go in an allotted time slot. We chose the evening and I’m glad we did, as to see them lit up at night was exquisite and romantic. It is easy to see why so many people have fallen in love with this city and its palace, which has attracted many famous artists, writers and poets. The last Nasrid Sultan is said to have wept when he was forced to leave his beloved palace as the Christian monarchs drove him out over the mountains, and the pass he went through is referred to as “The Pass of The Moorish Sigh”. It may be just a mythical story, and I can’t say that I cried when we left, but the whole place has left such an impression on me that I definitely want to go again.